Vampire Cattle are NPCs found in Volkihar Keep. They are used to feed the vampires within the castle. They wear roughspun tunics and footwraps. They frequently moan in pain and ask to be freed, but there is no way to help them. Lord Harkon tells you, once you agree to become a vampire, that he can provide all the feeding you will require. There are usually two vampires feeding on a cattle each in the lobby. 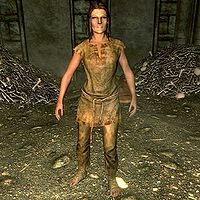 These cattle are impossible to feed on; however, you may feed on others in another area of the Castle Volkihar Keep. You may feed more than once if you would like to. It is not possible to kill them by feeding on them.